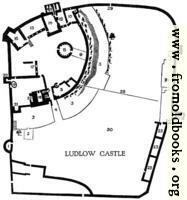 The site is mentioned in the Domesday Book, and thus predates the Norman Conquest (1066), but the earliest existing castle buildings are probably entirely Norman, from before 1100 or so. Formerly used as a Magazine, now [c. 1930] an Ice House. Stone Bridge of two arches which occupies the place of the ancient Drawbridge. A Newel Staircase leading to the Keep. Site of the Choir of the Chapel. 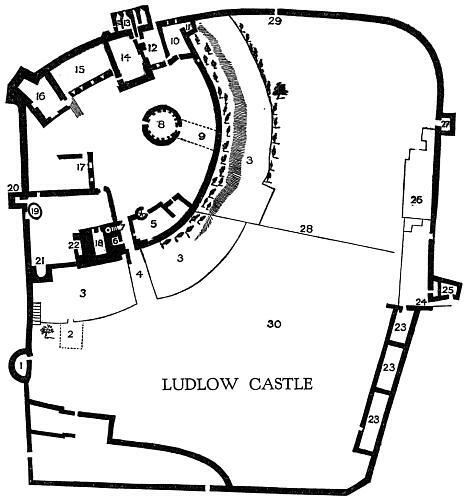 Apartments occupied by the two Princes sons of Edward IV. Supposed tower of Pendover. The Hall, or the Council Room. The Original Chapel, afterwards converted into a Prison. The Well, now [c. 1930] about 85 feet deep. A Tower, called the Lion’s Den. Small Norman Tower and Oven. The principal Gate-way leading to the Castle from the Town. Offices where the Fire Engines were kept. The Castle Yard or Outer Court. Ludlow Castle Web site with photographs, history, a virtual tour and other information.